The HPI E-Firestorm 10T Flux is identical to the original E-Firestorm—with one big exception. The new Flux version includes HPI’s Motiv brushless speed control and the Warp 5700 brushless motor. The motor is sensorless and features a 540-size can, high-quality ball bearings and external tabs for easy wiring. The Motiv speed control features LiPo cutoff, 7-cell NiMH and 2S LiPo compatibility and can handle a continuous current of 70 amps. Follow along as we show you the ins and outs of this speed demon. The E-Firestorm is a 2WD stadium truck that is RTR out of the box with a 2-channel AM radio, instructions, decals, preload spacers, hex drivers and a 4-way wrench for working on your car. Like the original E-Firestorm, the new 10T Flux comes with adjustable plastic bodied shocks, a 3 gear all-metal transmission with an easy-access slipper clutch, heavy-duty gear differential, rubber-sealed ball bearings and high-quality hex hardware. The body comes pre-painted and is available in silver or red. The boxes are not marked from the factory, so choosing your body color is based on luck. With the body off, you can see the quick-release screw tabs that hold down the battery; notice it easily fits a MaxAmps.com 6000mAh LiPo pack. The layout of this truck is clean, the receiver and speed control are on opposite sides of the main chassis for weight distribution and the turnbuckles, slipper clutch and suspension are easy to access for maintenance and tuning. Most of the chassis is made out of a composite nylon that is strong yet somewhat flexible to withstand crashes. We didn’t have any breakage during our testing. The rear Ground Assault tires are a medium compound pin-type tire that hooked up well. The Front Line front tires are ribbed and do a good job of pointing the truck in the right direction. Both are mounted on chrome Scorch wheels. The heart of this bad boy is the motor and speed control. Equipped onboard are a Motiv brushless speed control and the Warp 5700 motor. The motor is 5700kV and is a standard-size 540 can; it features external solder tabs for easy wire replacement, and it’s brushless, which means practically zero maintenance. The speed control can handle 7-cell NiMH or 2S LiPo batteries and has programmable built-in low-voltage cutoff. It comes pre-wired with Deans plugs, and can handle a continuous 70 amps and bursts of up to 380 amps. The speed control is programmable via an optional USB computer cord and software. 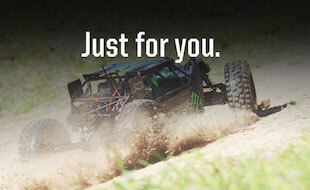 Like the regular E-Firestorm, the Firestorm 10T Flux comes complete with fully adjustable suspension components. Turnbuckles, multiple shock-mounting positions and Ackerman are just a few settings that you can adjust. corners at top speed. Overall, the Flux is a blast; it’s a durable, fast basher. There was no breakage, and the truck seemed at home on the BMX track. Check out the photo slideshow below for action pictures.